We can start to lose our hearing through the ageing process anywhere from the age of 40. 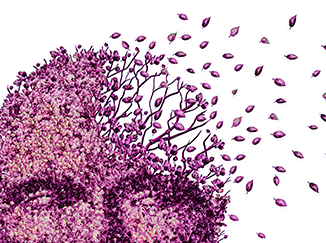 Recently, a number of studies investigating the impact of hearing loss on brain function have revealed that untreated hearing loss and dementia onset are linked. What we know is that atrophy of the brain is accelerated in people with identified hearing loss. MRI studies show a faster decline in the size of your brain when you have a hearing loss – this is scary stuff! Looking after your hearing is therefore critically important in maintaining good brain function. When your hearing range is reduced, extra strain is put on your sensory systems as you have to struggle to hear and communicate as you once did. This is an added stress on your body, particularly on brain function. Having a hearing loss mean increased cognitive effort or cognitive load on the part of listener, particularly in noisy environments. This has been shown to adversely impact the memory function of the brain. However, it’s not all bad news. Evidence from recent studies indicate that memory decline is slower in users of hearing aids, particularly if hearing aids were adopted at the first signs of age-related hearing loss. This happens because hearing aids have a part to play in reducing the effects of depression by keeping the brain active with auditory input, allowing the wearer to maintain meaningful social interactions and independence. Latest results (2018) from one of the larger studies – the SENSE-Cog Project (combined impact study of dementia, age-related hearing and vision impairment) – are worth noting. This study in investigating the rates of change in brain function in people before and after the use of hearing aids. Results to date are positive, suggesting that wearing hearing aids can help reduce the impact of cognitive decline, slowing down the onset of dementia. Other research shows that participating in rehabilitative treatment for hearing loss can reduce the number of cases of dementia. Hearing aids can’t reverse dementia, but what they can do is provide the brain with positive stimulation, reducing the impact of sensory deprivation from lack of auditory signals. Optimal hearing has been shown to be critical for optimal cognitive health. The studies all point to the fact that rehabilitation for hearing should be taken as soon as a loss of hearing acuity is noticed. Without optimising your hearing, a flow-on effect can occur, with cognitive decline and dementia being the one of the resultant conditions. To read more on the SENSE-Cog Project, click here.